The 10 Best Spots for Paint & Wine in Connecticut! Are you looking for a different night out with friends? Consider grabbing your paint brushes and a bottle of wine for a paint night—an evening of art, wine, and good fun. Numerous venues across Connecticut have started hosting these entertaining events, but don’t worry, you don’t need to have any artistic abilities to join in! Here are the 10 best! Hosted by the TDP Art Studio, The Drunken Palette offers fun painting events for kids, adults, tweens, and teens (but of course, only the 21 plus crowd can drink!). At one of their fun painting nights, a talented staff artist will teach you how to create a selected painting, providing step-by-step instructions and helpful hints along the way. You’ll be provided with a canvas, brushes, and the necessary paint colors to create that day’s painting. Check the calendar to see the painting options, pick your favorite, and sign up! The Drunken Palette is BYOB. Let the artistic interiors and great lighting inspire you during an evening of painting fun at Muse Paintbar. Unlike some of the other options on this list, Muse Paintbar has a staffed kitchen and bar, so no need to BYOB! Some events offer a free drink, and snacks can be purchased prior to the start of a painting class. At Muse Paintbar, learn to paint on canvas, or select a class offering wine glass or wood sign painting. All ages are welcome to join in on the fun. This BYOB art studio encourages you to bring a bottle of wine, snacks, and friends to learn to create a great work of art. The staff artists will instruct the class on how to create the piece, providing critiques along the way. Just don’t dip your paintbrush into your wine! Create memories with friends as you test out your artistic talents while recreating one of Pinot’s Palette’s beautiful paintings. Perhaps the most fun part of the evening is to look at everyone’s paintings side by side to see everyone’s unique painting style of the same painting. Also, don’t worry about bringing your own drinks as Pinot’s Palette has a well-stocked bar. During the two-hour painting class at Artique, guests will learn to recreate a selected painting while indulging in BYO wine or beer. 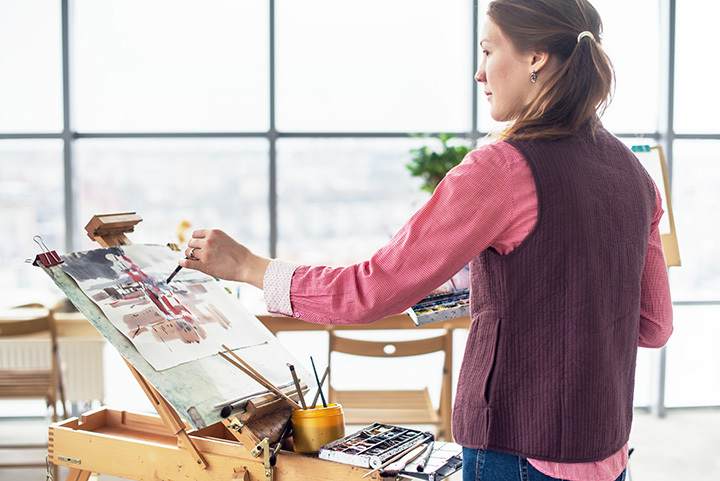 There is no need to have any prior painting experience or artistic skills, as the friendly instructor will guide you to creating a masterpiece. They also offer events such as couples nights, singles nights, and themed nights. Opened by two Massachusetts Institute of Art alums, SplatterBox allows for a bit more creativity and personality with your masterpieces. Instead of painting the exact same thing, some variation is allowed and encouraged. They offer weekly sip and paint classes every Thursday from 7 to 9 p.m. as well as children’s parties and staff retreats. The Studio Fairfield aims to help young and old realize their artistic potential by hosting numerous art classes for children and adults alike. In addition to their regular classes and clubs, they host BYOB art parties for adults on Thursday nights and kid’s birthday parties by reservation. Test out your artistic abilities, and perhaps see if a glass of wine helps or hinders your talents. Stop by BrushStroke during one of their adult open painting sessions. BrushStroke supplies the canvas and paint brushes, you bring the snacks and drinks, and you’re sure to have an evening of creative fun. They also hold fundraiser painting nights to support local initiatives and charities. With their paint, sip, and giggle events, adults can come together for a night of something different. Each event can be found online, so you can select the painting you love in advance. They also have evenings of wreath making, so you could even learn another creative skill! Feel free to bring drinks, glasses, and snacks to accompany your night of fun. This kid-friendly crafting venue takes creativity to a whole different level by offering a wide array of classes and events. In addition to adult painting nights and kids painting nights, they have mom and me events and fundraisers. Public painting nights are held once per month for kids and adults. Their adult events are BYO drinks and snacks.